Most self-help books are fairly general, particularly when the author is addressing anyone instead of a targeted audience. 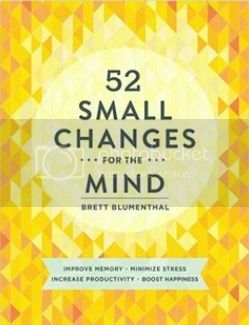 52 Small Changes for the Mind by Brett Blumenthal suffers a bit from the one-change-fits-all approach, but still offers plenty of ideas and resources for those looking to make mindful changes in their lives for the first time. I would not recommend following this book as the weekly guided program it was intended to be. Not all of the changes are small (Be a Guru) and some will be costly (Get Out of Town). While I appreciate many people will like the Get a Rubdown change, those of us who are disabled, suffer from chronic pain or simply not comfortable with being touched by strangers would absolutely not benefit from it. Any changes in regard to diet should be first discussed with your physician before implementation; some may cause problems with certain medications or conditions. This book is well-written, and has much to offer the mindful-living novice, but it probably should have been formatted as a resource reference versus a program guide. If there is a person out there who can actually make and maintain all these changes in 52 weeks? I bow to you in advance. Just as an aside, I am all about mindful living, and have been for quite some time. Out of curiosity I counted how many changes in the book I'd already made in my life before reading it. 42 out of 52 -- and that took me about twelve years, give or take. I received a free copy of this book in exchange for an honest review from Library Thing's Early Reviewers Program.